Need (or just want) a kicky new purse for spring and summer? 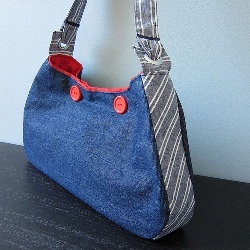 Kat from Just Crafty Enough shows how to make a hobo bag with nautical-inspired styling. A pair of red buttons on front look like sailor pants, and the grommets on the straps are reminiscent of sail hardware. Get the tute.